A forum at the Sustainable Living Festival on Sunday February 14th will launch BikeSpot, a unique bike safety project. 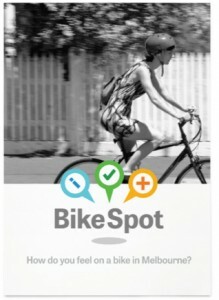 Intended to uncover where Melbournians feel least safe while riding, the BikeSpot project will be officially launched at the forum RIDING IN MELBOURNE: PERCEIVED FEAR OR REAL RISK- Is our fear of riding holding us back? A panel of expert speakers including Pip Carroll, Founder and Director of The Squeaky Wheel, Jane Waldock, Manager Sustainability & Strategic Transport, City of Yarra and Alexander Sheko, Consultant, GTA Consultants will examine perceived risk, how it affects people’s decision to ride and how this plays out in Melbourne. Melbourne is still striving to become a world-class cycling city. Is fear of riding holding it back or is it genuinely unsafe on the roads? The panel discussion will be followed with the opportunity for questions from the audience. Forum – RIDING IN MELBOURNE: PERCEIVED FEAR OR REAL RISK- Is our fear of riding holding us back?